This book is intended as an introduction for programmers who are not familiar with Caché or who are familiar with only some kinds of Caché programming. It is not a tutorial but rather a survey of the elements in the Caché toolkit, with information on how these elements fit together. After reading this book, you should have an idea of the options available to you and where to find more information on those options. For this book, the emphasis is on server-side programming, rather than client-side programming. Via various Caché language bindings, a Caché server can work with clients written in many different languages. If you are creating or maintaining such clients, most of this book is probably inapplicable to you. Caché is a high-performance object database with several built-in general-purpose programming languages. It supports multiple processes and provides concurrency control. Each process has direct, efficient access to the data. Routines and classes can be used interchangeably and can be written in more than one language. Database storage is an integrated part of all Cache programming languages. Older Caché applications consist entirely of routines, because these applications were written before Caché supported class definitions. In contrast, some newer applications are written almost entirely in classes. You can choose the approach that is appropriate for your needs. ObjectScript, which is a superset of the ISO 11756-1999 standard M programming language. If you are an M programmer, you can run your existing M applications on Caché with no change. This is the most common language for Caché routines. Caché MVBasic is an implementation of MultiValue. It includes commands, functions, and operators that are used in the various MultiValue implementations, and it supports multiple emulation modes so that you can use syntax that is familiar to you. Caché Basic is an implementation of Basic. The next chapter provides an introduction to ObjectScript. This book does not discuss Caché MVBasic or Caché Basic in any detail. Caché also supports classes. You can use the system classes and you can define your own classes. In Caché, a class can include familiar class elements such as properties, methods, and parameters (known as constants in other class languages). It can also include items not usually defined in classes, including triggers, queries, and indices. The chapter Basic Ideas in Class Programming provides a brief introduction to class programming, for the benefit of readers who have not done this kind of programming. The chapters after that discuss classes in Caché and the unique capabilities of persistent classes in Caché. ObjectScript, Caché Basic, and Caché MVBasic include functions to iterate through the nodes of a global and quickly access values. In Caché, a database contains globals and nothing else; even code is stored in globals, as described later in this book. At the lowest level, all access to data is done via direct global access  that is, by using commands and functions that work directly with globals. Many currently running applications were developed long before Caché included support for classes. Some of these applications use direct global access. Other applications use custom APIs such as FileMan, which is in the public domain. These APIs, of course, internally use direct global access. Because object classes provide a more controlled interface, and because Caché persistent classes are projected to tables that can be queried via SQL, it is often desirable to add a class interface to existing applications. You can do so, if you understand the structure of the globals. Globals are stored physically in a highly optimized structure, and the code that manages this structure is separately optimized for every platform that Caché runs on. These optimizations ensure that operations on globals have high throughput (number of operations per unit of time), high concurrency (total number of simultaneous users), efficient use of cache memory, and require no ongoing performance-related maintenance (such as frequent rebuilding, re-indexing, or compaction). The physical structure used to store globals is completely encapsulated; it is generally unnecessary to consider the physical data structure. Global storage is sparse, meaning that only nodes with data values are stored in the database. This means that Caché often requires less than half of the space needed by a relational database. The hierarchical structure of globals typically models real-world data more closely than is possible with relational tables. The sparse nature means that new fields can be added without any overhead and without rebuilding the existing database. More data can be read or written with a single I/O operation, and data can be cached more efficiently. As noted previously, Caché provides an implementation of SQL, known as Caché SQL. The first line is embedded SQL, which executes a Caché SQL query and writes a value into a host variable called myvar. Note that you use slightly different syntax to include an include file within a class definition. See Macros and Include Files in Class Definitions, later in this book. It is useful to understand how Caché uses the code elements introduced in this chapter. The reason that you can use a mix of ObjectScript, Caché SQL, Caché MVBasic, macros, class definitions, routines, and so on is that Caché does not directly use the code that you write. Instead, when you compile your code, the system generates the code that it uses, which is OBJ code, used by the Caché virtual machine. The CSP engine converts CSP files into class definitions. 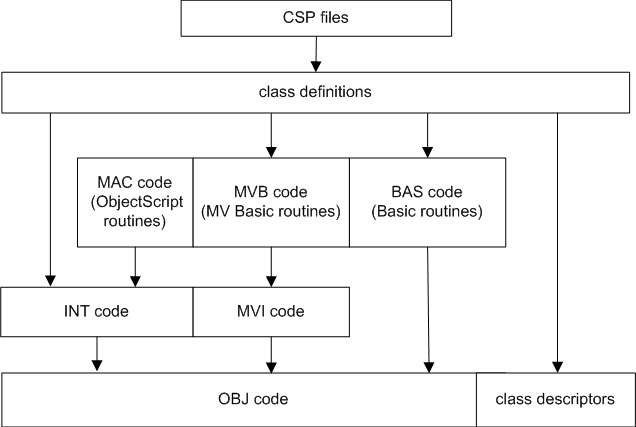 The class compiler uses the class definitions and generates INT code, Caché MVBasic code, and Caché Basic code, depending on the languages used to define the methods in the classes. In some cases, the compiler first uses classes as the basis for generating and saving additional classes. You can look at these classes in Studio, but do not modify them. This occurs, for example, when you compile classes that define web services and web clients. A preprocessor (sometimes called the macro preprocessor or MPP) uses the include files (not shown in the figure) and replaces the macros. It also handles the embedded SQL in the ObjectScript routines and the MVBasic routines. Additional compilers create INT code for the ObjectScript routines and MVI code for the MVBasic routines. This layer is known as intermediate code. In this layer, all access to the data is done via direct global access. Both INT code and MVI code are compact but human-readable. A later section of this book shows you how to find this code, which can be useful for diagnostic purposes. Note that there is no intermediate code for Caché Basic. INT code, MVI code, and Caché Basic are used to generate OBJ code. The Caché virtual machine uses this code. Once you have compiled your code, the routines, INT code, and MVI code are no longer necessary for code execution. After you compile your classes, you can put them into deployed mode. Caché has a utility that removes the class internals and the intermediate code for a given class; you can use this utility when you deploy your application. If you examine the Caché system classes, you might find that some classes cannot be seen because they are in deployed mode. All routines and class definitions are stored in the same Caché databases as the generated code. This fact makes the code easier to manage. Caché provides a robust set of source control hooks for Studio that InterSystems developers have used for many years. You can use these hooks as well; for an introduction, see Development Tools, later in this book.